Discussion in 'Pit Bull News' started by Jefferson, Oct 24, 2014. 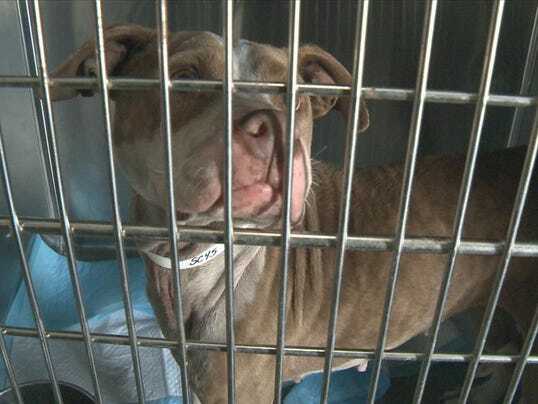 Gaston, SC (WLTX) - Federal authorities say an investigation into drugs in and around the Columbia area led them to a dog fighting operation in Gaston. Agents responded to a home on Meadowfield Street Friday. The American Society for the Prevention of Cruelty to Animals was at the scene collecting animals. Agents say early last year, multiple agencies began investigating the drugs activity around a downtown Columbia neighborhood. That probe led them to a drug organization that was selling crack and power cocaine in the area, and who were involved in robberies and other crimes. Agents say they learned who the man supplying the organizations with drugs was, and learned that he also was involved in breeding and fighting dogs. Officers served a search warrant on the Meadowfield Street property Friday, seizing a dozen dogs. According to authorities, the dogs had scars commonly associated with dog fighting, and were found chained and anchored to car axles. Trash barrels were being used as makeshift shelters. Officers say they also found emaciated and dead dogs, as well as dog fighting paraphernalia. Investigators say this wasn't the first seizure. Back on October 1, agents searched the alleged drug supplier's home, and seized 35 dogs. The ASPCA will provide daily care for the dogs until a custody hearing can be held. Seven people have been indicted on federal drug charges in connection with the case. News video available at link. 12 dogs would nt call that big but those dogs had no scars that was some dope boy with a few dogs still damn shame. "Investigators say this wasn't the first seizure. Back on October 1, agents searched the alleged drug supplier's home, and seized 35 dogs." GASTON, SC — Secret court-approved wiretaps on alleged Columbia cocaine dealers* cellphones prompted FBI agents to bust a large Lexington County facility used for training pit bulls to fight, authorities said Friday. Some 48 pit bulls, many emaciated, have been seized by the FBI and a national response team from the Society for the Prevention of Cruelty to Animals, according to those involved and documents in the case. The animals, who lived outside tied to chains, were in a wooded area outside Gaston in rural Lexington County, according to officials. On Friday afternoon, a 12-person national emergency animal response team directed by the American Society for the Prevention of Cruelty to Animals was on the scene, assisting the FBI with the final stages of taking about a dozen remaining animals into custody, an ASPCA official said. Agents and local law enforcement executed another warrant at the Gaston address earlier this month. On Oct. 1, agents seized 35 dogs, along with drugs, guns, and cash, according to the U.S. Attorney*s office in Columbia. The site is occupied by a man identified in an FBI affidavit by agent Brian Jones as Eric Dean “Big E” Smith, 41, of Gaston, who was indicted Friday for cocaine trafficking. Smith*s lawyer, Debbie Barbier of Columbia, declined comment late Friday. According to excerpts of FBI wiretaps made public Friday, Smith had as many as 35 dogs at the site on Sept. 16, when he took them to a veterinarian*s office in West Columbia to get rabies shots. Smith is heard complaining that the Lexington County Animal Control office cited him for not giving his animals rabies shots. On another call, Smith tells an unidentified man that fighting dogs in South Carolina aren*t as good in organized dogfights as dogs bred in other states. In the same call, Smith says he will sell one of his dogs for $2,000. The Gaston dogfight operation was discovered during an ongoing FBI, state and local investigation into a Columbia area gang cocaine operation tied to the Bloods street gang, according to federal court records and sources familiar with the investigation. Besides Smith, others indicted as a result of the wiretaps are: Gerald Montez “Bird” Burris, 46; Amos “Famous Amos” Donnell Jones, 34; Stephoni “Steezy” Vernard Sumter, 28; Tony L. Gunter, 36; Travis “Hip” Santale Sulton, 31; Dion W. Jones, 31; and Travis Leon “Jit” Gilbert; 27. The dogfighting investigation continues, authorities said. “We are on the scene at the request of the U.S. Attorney*s Office and FBI to assist with the dog-fighting investigation,” Tim Rickey, vice president of the ASPCA*s field investigations office in New York City, said Friday in a telephone interview. “Our team was here to assist with collecting animal dogfighting evidence, to help process the crime scene, and the collection and removal of the animals,” Rickey said. The dogs will be taken to shelters at an undisclosed location and evaluated by some 30 other people, he said. Rickey said dogs at the site, about one-half mile off Meadowfield Road, had scars and injuries associated with dogfighting. The dogs were found chained and anchored to car axles, with trash barrels being used as makeshift shelters, according to the U.S. Attorney*s Office. Adult dogs and puppies were found severely emaciated and dehydrated, and the remains of deceased dogs were also discovered on the premises, along with dogfighting paraphernalia. Dogfighting, a multi-million dollar, blood-sport business, is illegal under federal and state law. On Friday, 24 defendants made initial appearances in federal court in Columbia to face charges of conspiracy to traffic cocaine and crack cocaine and supply the illegal drugs to street gangs, according to a press release from the U.S. Attorney*s office. The defendants were arrested over the past two days by a federal, state and local authorities, including the Columbia Violent Gangs Task Force. The FBI, the Richland County Sheriff*s Department, SLED and the Columbia Police Department participated. In recent years, the FBI and the task force have made numerous high profile round-ups of Columbia cocaine dealers. But cocaine dealers continue to flourish in the area. According to one wiretap made public Friday, Smith told an unidentified caller that he was selling three to four kilograms of cocaine every week. Smith said he paid $42,000 per kilogram, and was able to sell the cocaine for $1,300 an ounce. There are 35.2 ounces in every kilogram, so Smith could sell a kilo for about $45,760 * making a profit of some $3,700 per kilo. It's been stated the dogs look well and no scars. LEXINGTON COUNTY, SC (WIS) -The indictment of eight people on drug charges in Lexington County led FBI agents to a dog fighting operation in Lexington County this month. Forty-eight dogs, mainly pit bulls, were recovered by the FBI and the American Society for Prevention of Cruelty to Animals. Prosecutors said the dog fighting operation is tied to a drug organization that was allegedly peddling cocaine and crack cocaine in downtown Columbia. The bust has some residents in Gaston wondering if their pets were part of the dog fighting ring. "It's very heartbreaking,” said Swansea resident Donna Goodwin. “I cried most of the night being afraid that my dog was actually being used to fight, because he was a family pet." Goodwin's pit bull went missing from her Swansea home in July and she's not alone. Others have contacted WIS about pit bulls vanishing in the Gaston area as well, many wondering if the disappearance could be tied to the apparent dog fighting. "I would definitely say it's a big coincidence that so many of us in this area have lost dogs, all bull dogs," Goodwin said. "Jolie's dog came up missing, and she lives close to me as well, within six or seven miles of me. Her dog came up missing at the same time. Bo, actually lives just across the street from me. His bull dog, who was about five months old, came up missing. All are family pets." Prosecutors said Eric Dean Smith, the owner of the home, was buying and breeding dogs, and it's possible that he could have stolen dogs too, as of now there is no evidence of that. When agents raided the home this month, they found trash cans being used as dog houses, dog fighting paraphernalia, drugs, guns, cash, and a number of dead dogs too. The dogs have been taken to undisclosed spots around the country where they will be rehabilitated. "I was hoping that there was a way for all of us who are missing a dog to be able to send information to one location to see if our dog might be there," Goodwin said. No one has been charged for dog fighting or animal cruelty at this time, but the investigation is still active and ongoing.